UVACollab HelpUVACollab DocumentationAssessments & Grading GradebookHow does a points Gradebook calculate automatically dropped grades? Dropped grades are omitted from the course grade calculation, and the total points possible in the category are reduced by the point value(s) of the omitted item(s). When using the Keep Highest option instead of Drop Lowest to drop the lowest grade(s), no grades will be dropped in the category until the number of items kept is exceeded. Below is an example of how course grades are calculated when grades are dropped/kept. Note: All gradebook items in the category must have the same point value to enable the drop/keep options for that category. Tip: For more information about course grade calculations, see How are grades calculated in a points Gradebook? For steps to enable dropping/keeping grades in your Gradebook, see How do I set up my Gradebook? The sections below describe how grades are calculated within each category, and how the course grade will be calculated in this example Gradebook with Categories & weighting. When using the Keep Highest option instead of Drop Lowest to drop the lowest grade(s), no grades will be dropped in the category until the number of items kept is exceeded. The example below demonstrates how the student's category average is affected by entering the third assignment grade in the Assignments category with the setting Keep Highest: 2. Note: If Drop Lowest were used instead, Student One's Assignments grade would have been calculated as only 8 points earned out of 10 points (80%). Keeping the highest grades instead of dropping the lowest grades ensures that Student One's grade is calculated out of the same number of total points (20 points) both before and after entering the third assignment grade. Note: If Drop Lowest were used instead, Student One's Assignments grade would have been calculated out of 10 points (the grade from Assignment 1 only) before entering the third assignment grade, and 20 points (the grades from Assignment 1 + Assignment 3) after entering the grade. Note: In a Gradebook with Categories only, the sum of the points the student received in all categories will be divided by the total points possible; there will be no step at the end to weight the category averages. Prev: How are grades calculated in a points Gradebook? How does the Peer Assessment feature work? How do I set up Gradebook Classic? How do I add items to the Gradebook Classic? How do I enter grades and comments in Gradebook Classic? How do I exclude a grade for a particular student? How do I export grades from the Gradebook Classic? How do I import an individual Gradebook item into Gradebook Classic? How do I import an entire spreadsheet into Gradebook Classic? How do I grade using iRubric in Gradebook Classic? How do I upload scanned test results to Gradebook Classic? 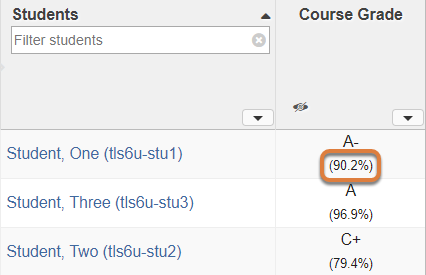 How do I modify Course Grade Thresholds? How do I export final grades to SIS (Student Information System)? How do I edit a Gradebook item? How do I remove a Gradebook item from Gradebook Classic? What is the Post'Em tool? How do I add Post'Em feedback? How do I create a mid-semester evaluation for my course? What is the iRubric tool? How do I grade using iRubric? How do I grade with iRubric in Assignments?